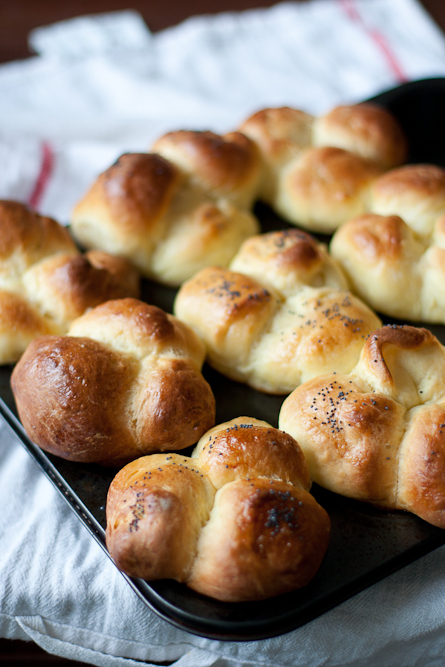 Brioche for some reason has always intimidated me. I’ve baked bread and rolls before, but something about it has often made me push it back on my very informal Must Bake list. Perhaps it’s the waiting game: the first rise, deflating the poofy dough, then the gentle kneading followed by the second rise, more thumb-twiddling before it finally goes into the oven. And when they’re done, showing off its golden glory, I wonder why I don’t make bread more often. 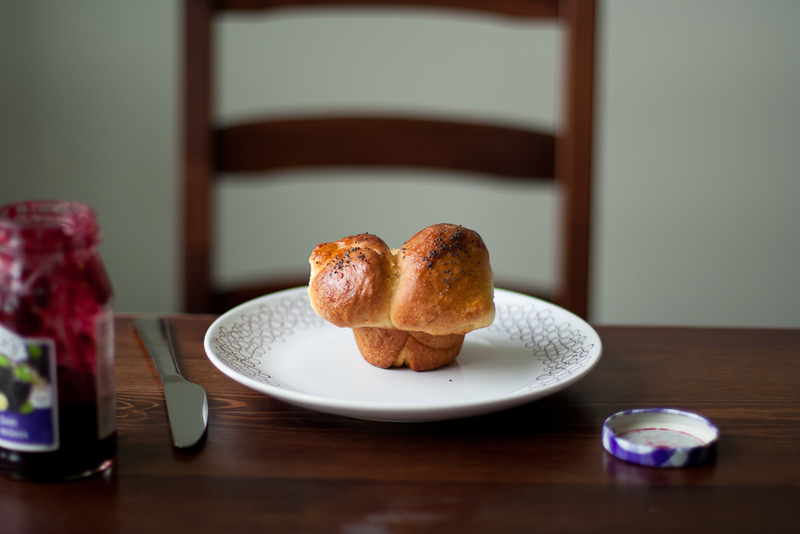 What threw me off about this brioche was its scent of milky sweetness. It was unlike anything else I’ve made at home. Of all things, it reminded me of a Chinese bakery; even when I toasted them for breakfast the rest of the week, its distinct waft made me weak in the knees. I was ecstatic when these were done. They sat on a wire rack to cool while my mom nudged me to eat one despite my best intentions to avoid burning my tongue. A few more nudges later, I gave in and we split one, eating it plain with our bare hands, the second one disappeared quickly too. 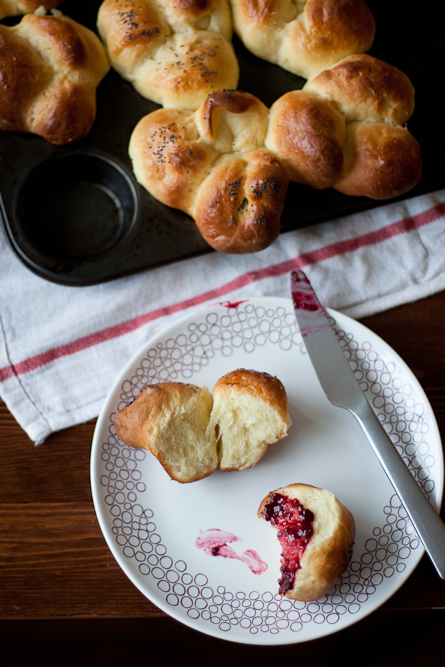 I totally get it now, I get why brioche is really that good. The springy, tender grain is so soft I could use it as a pillow. The browned top is just crispy enough to get that striking contrast to the feather light buns. They even taste good the next day, lightly toasted with a smear of blackberry jam. 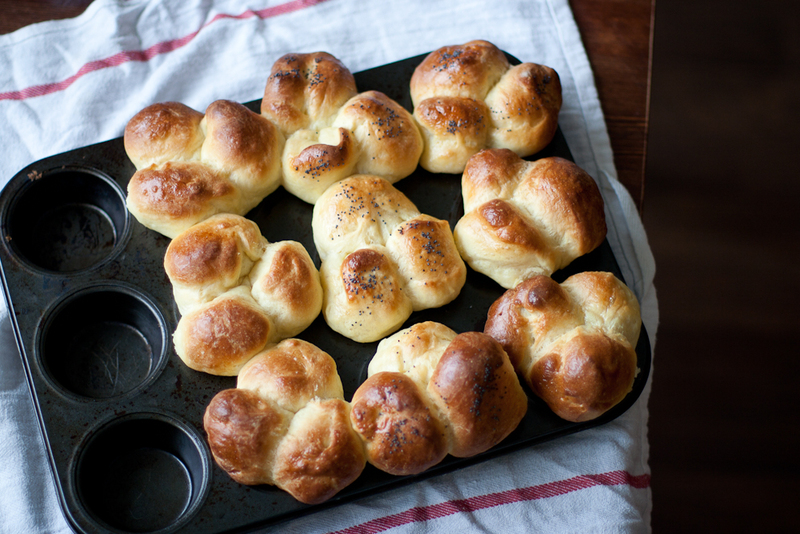 Oh Bubble-top Brioche, you amaze me. I had a serious debate in my head of which brioche recipe to use. 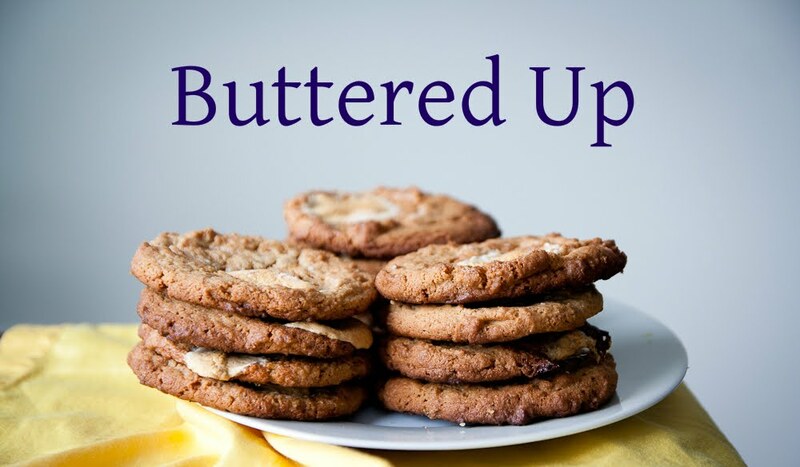 The contenders were: Nick Malgieri’s recipe from his cookbook Bake! or Dorie Greenspan’s recipe from Bon Appetit. I’ve read each recipe a thousand times just to make sure I wouldn’t screw up. Finally I went with Nick’s method since it seemed the easiest and followed Dorie’s instructions for forming the brioche, hence, their cute names. Making bread isn’t difficult, though it takes a ton of patience and some technical know-how to get it right, the recipe I’ve included is epic long, but believe me when I say it is worth every bit. It is tremendously helpful to have an electric stand mixer to do most of the heavy mixing. Measure all fluids with a thermometer or the yeast won’t survive and the dough won’t rise (allow fluids to reach a maximum of 110°F). Don’t let the sponge rise more than twice its size or it will lose some of its leavening power and give the dough a sour flavour. Ensure the butter is soft enough or your dough will be lumpy. Be careful that the dough doesn’t over-rise after mixing or shaping or it may not keep its even shape when baking. After rising, the brioche dough is fairly sticky. For best results, flour your hands instead of the work surface or the dough. 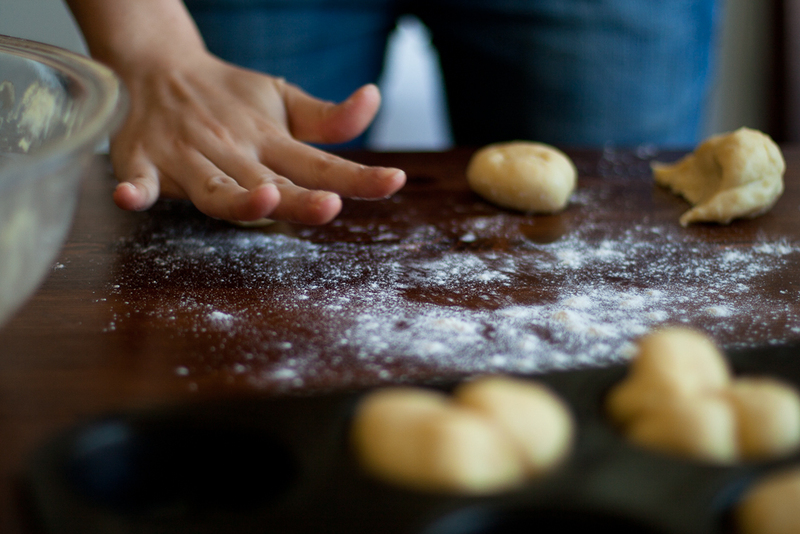 If you’re shaping the dough, chill it thoroughly for several hours or will be difficult to roll and shape. For the sponge, warm the milk in a small pan over low heat; pour it into a small bowl and allow it to cool to 100°F . Cover with buttered plastic wrap and chill overnight. Remove dough from fridge and allow to soften at room temperature until it is no longer ice-cold. Butter 12 standard muffin cups. Flour your hands and divide dough into 12 equal pieces; cut each piece into thirds. Roll each small piece between palms into ball. Place 3 balls in each prepared cup (dough will fill cup). Place muffin pan in warm draft-free area; cover with a sheet of buttered plastic wrap. Let dough rise until almost doubled (dough will rise 1/2 inch to 1 inch above top rim of muffin cups), 50 to 60 minutes. Position rack in center of oven and preheat to 400°F. Place muffin pan on rimmed baking sheet. Gently brush egg glaze over risen dough, being careful that glaze does not drip between dough and pan (which can prevent full expansion in oven).